The title bar shows the connection name and the host name of current connection. More information on Object Browser can be found here. More information on SQL Window can be found here. If the script in the active tab of the SQL Window was saved in a file, the file name is displayed here. More information on Result Window can be found here. 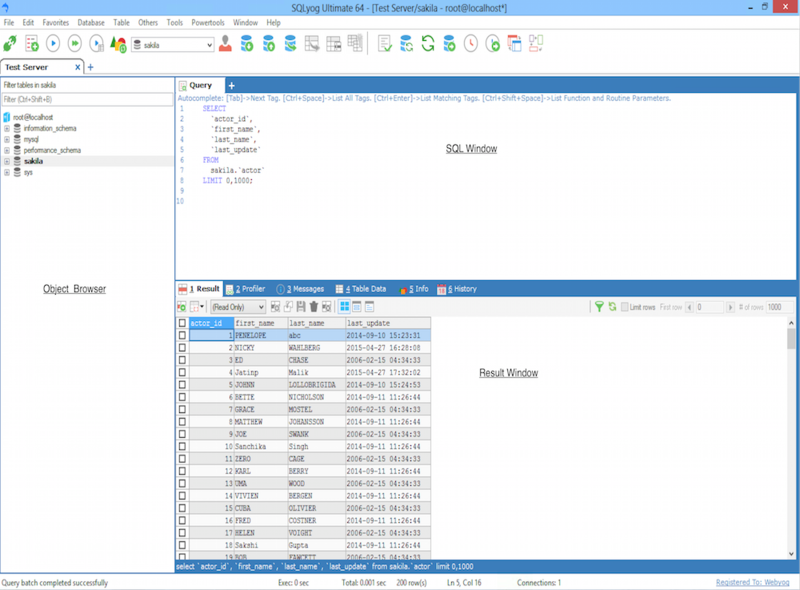 General Information: Information about work being done in SQLyog, description of the menu item selected. Process Time: Time taken (in hh:mm:ss:ms) to execute the query i.e. Execution time and Total time. Note: In HTTP connection only Total time is displayed. Number of rows in the currently selected Resultset. Line number and column number in which the cursor is located in different Edit windows. Number of connections which have been made in SQLyog. Tabbed interface lets you open connections in separate tabs, so that you can jump between them quickly and easily. Tabs will be colored (if chosen) like the Object Browser. To switch between tabs use the shortcut keys Ctrl+n where n specifies the tabs no (e.g. Ctrl+1, Ctrl+2 etc). Ctrl + 9 shifts the focus to the last tab in the connection level irrespective of the number of tabs present. NOTE: Drag and Drop of connection tabs(when there are multiple connections)and query level tabs is possible. Also note that Tool tip is implemented for the query level tabs. When you roll the mouse over a tab, it shows the name of the corresponding tab and if a file is opened in the tab then it will show the fully qualified name of that particular file.